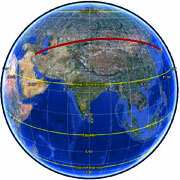 Site http://www.movable-type.co.uk presents a variety of calculations for latitude/longitude points, with the formulae and code fragments for implementing them. All these formulæ are for calculations on the basis of a spherical earth (ignoring ellipsoidal effects) which is accurate enough for most purposes. ← Google annunci, ecco cosa sa di noi!